The last 25 miles of the Russian River wind from the Wohler Narrows through a rock-bound forested canyon to the Pacific Ocean. The towns of Guerneville and Monte Rio lie in this canyon and are well-known for floods. 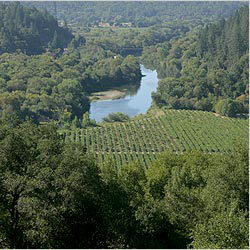 Vineyards and orchards occupy the few flat areas along the river that are not developed for residences. Before settlement by early pioneers, the Russian River canyon and its tributaries held some of the largest redwood trees. Many were cut down from the 1860s to 1880s to build houses in San Francisco and other surrounding areas. River Road was once a logging railroad, then a tourist line as the lumber mills closed in the late 1800s and vacation resorts were developed. Today, the lower river canyon is a popular tourist destination with a year-round residential population and a few farms. Tributary creeks include: lower Green Valley, Hobson, Fife, Hulbert, Dutch Bill, Freezeout, Austin, Willow, and Sheephouse Creeks. 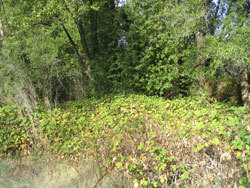 This 46-acre site includes a large redwood riparian forest with an infestation of invasive non-native blue periwinkle and Himalayan blackberry. Working with the Fish Friendly Farming program, a project eradicating these species and restoring native habitat including some additional riparian forest areas to support nesting songbirds was implemented.